West Lodge01485 571770work01485 571770fax Self-cateringWest Lodge is a pretty Edwardian gate lodge situated at the former entrance to Sedgeford Hall. It is in the conservation area of Cole Green overlooking a wooded valley set in its own garden with private parking. The lodge has a wide south facing veranda. The one double-bedroomed accommodation is well equipped for two people. 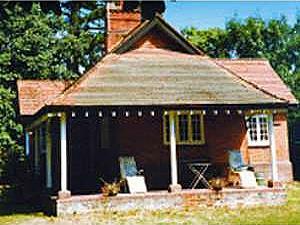 West Lodge is a pretty Edwardian gate lodge situated at the former entrance to Sedgeford Hall. The spacious sitting/dining room has two settees. Electric/gas cooking, fridge, electric shaver points. Children welcome from any age. A149 King's Lynn to Hunstanton at Heacham Lavender Farm turn right to Sedgeford, turn right at war memorial, on right driveway, entrance gates. West Lodge is on the left hand side of drive. Bus link to Hunstanton - taxi approximately 5 miles or from bus station - 2 buses a day via Sedgeford.